Add the leeks and onion. Cook, stirring occasionally, until the leeks are tender, about 5 minutes. Add the garlic and spinach; season with salt and pepper. Cook until the spinach is completely wilted, about 2 minutes. Remove from the heat and set aside to cool. In a large bowl, combine the ricotta, 2 eggs, and thyme. Gently stir the cooled vegetable mixture and olives into the ricotta mixture. On a lightly floured surface, roll the puff pastry into a 12-inch square. With a knife, cut the dough into a circle by cutting off the corners of the square. Transfer the dough circle to the prepared baking sheet. 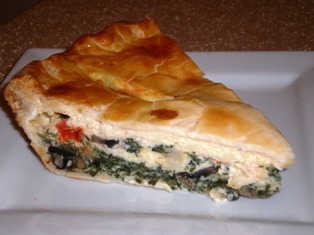 Spoon the vegetable filling into the center, leaving a 2-inch border of pastry all around. 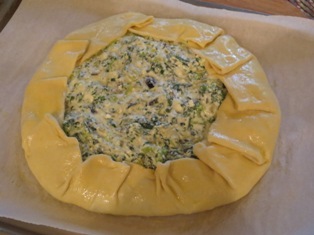 Gently fold the edges of the pastry over the filling, leaving the filling exposed in the center. In a small bowl, whisk the remaining egg with 1 tablespoon of water. Brush the egg wash over the pastry border. Bake for 45 minutes, or until the pastry is golden brown. 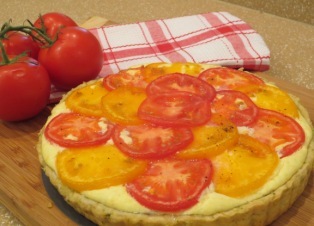 Let the tart cool for 10 minutes before serving. 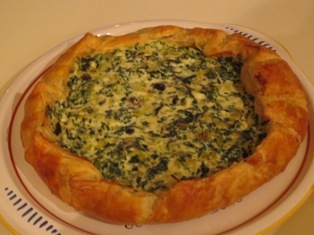 A delicious vegetarian tart with a crisp puff pastry crust filled with a mixture of leeks, spinach, olives, and ricotta cheese. 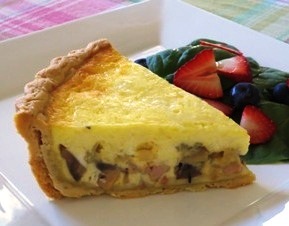 A great dish for lunch or brunch. These six, stackable, bowls are easy to store and organize. Designed with durable 18/8 stainless steel construction and finished with a reflective, mirrored exterior the bowls ensure both attractive presentation and high quality strength.